This pleasing vintage double barrel percussion shotgun will be most appreciated by Civil War collector / historians with particular interest in the number of arms purchased across Europe by Confederate States buyers. We will begin by recommending the newly published and ground breaking Confederate & Southern Agent Marked Shotguns by Russ A. Pritchard & John W. Ashworth as offering insight with respect to this piece and a must have in the library of serious enthusiasts of Confederate used arms, particularly with respect to the wide use of muzzle loading percussion shotguns, import and domestic. This particular arm remains in pleasing as found condition just as it was set aside decades ago. With good evidence of age and period use, yet with no diminishing issues. Exposing the barrels underside offers a myriad of Liege markings common to Civil War vintage shotguns. Liege proof marks, E over LG over * in an oval, a small crown over N, a script EL and the telltale match marks frequently referred to by Confederate collectors as Roman-numerals are present as seen on the Confederate South Agent identified shotgun illustrated on pages 194 & 195 of the above reference. The back of the back-action locks are unmarked save the earlier mentioned typical chiseled match marks on the lock plate edges. Of significance is the fact that this example, while having the typical script floral engraving, is completely devoid of the usual engraved maker identification as is found on commercially imported sporting shotguns of the era. 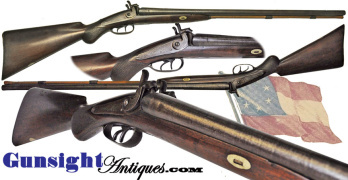 Examples of Confederate provenanced, un-maker marked Liege shotguns may be found on pages 37, 54 and 56 of Confederate & Southern Agent Marked Shotguns . Whether the maker name was left off to avoid a connection between the supplier and war time Southern States arms trade, or if left off simply to provide space for sales agent engraved identification, will be left to speculation. This example measures approximately 48 5/8 inches in total length with patched .69 caliber bore, 33 inch Damascus barrels. A frequent arm of the Confederate Infantry, with shortened and full length examples commonly associated with Confederate Cavalry, the percussion muzzle loading shotgun saw considerable use both early on and through the duration of the Civil War. Overlooked by all but a few collectors for years the vast majority of surviving war time examples have gone the way of time. Buy with confidence! We are pleased to offer a no questions asked three day inspection with return as purchased on direct sales! Just send us a courtesy e-mail to let us know your item will be returned per these provisions and your purchase price will be refunded accordingly. Thanks for visiting Gunsight Antiques! A note about firearms: WE EMPHASIZE HERE THAT THIS PIECE IS CONSIDERED AN ANTIQUE / COLLECTABLE. IT IS OFFERED AS A HISTORICAL COLLECTABLE ONLY AND IS NOT TO BE CONSIDERED FIREABLE UNDER ANY CIRCUMSTANCES. PURCHASE OF THIS ITEM WILL CONSTITUTE A FULL UNDERSTANDING OF AND AGREEMENT WITH THE ABOVE.